My husband and I went to a book signing party yesterday at the home of one of his former co-workers. I had given the couple a quilt when they got married and later the co-worker hired me to make a Crown Royal quilt for her husband. 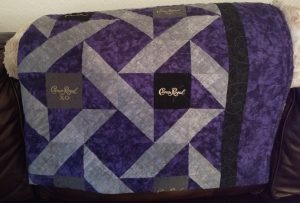 He had gray Crown Royal bags, so I wanted to make something different from my usual Crown Royal quilt pattern. I was very pleased when I saw the Crown Royal quilt on the back of our friends’ couch. Then I was told by another guest at the party that the one I gave them for a wedding gift was on the guest room bed. So I figured I’d get a couple of pictures to share. 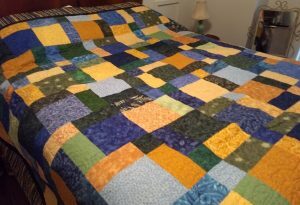 I had forgotten what the wedding gift quilt looked like, so it was nice to see it again. It’s always pleasant to find out that the quilts I make are being put to good use and not just stuffed in a closet out of sight.